LOFT-INSPIRED. AND JUST INSPIRED, PERIOD. 875 Queen Street East elevates the urban experience along this downtown Toronto bustling strip in the heart of Leslieville. Close to the multi-sport indoor and outdoor recreation of Jimmie Simpson Park, 875 Queen East is a boutique condominium designed to enhance the built-form with a modern, unadorned aesthetic while maintaining the defined style of the neighbourhood by incorporating the existing Empire-style heritage facade. The seven storeys of loft-inspired residence overlooks the lively Queen Street East and incorporates organic architectural building step backs offering the natural elements of modern balconies and terraces. 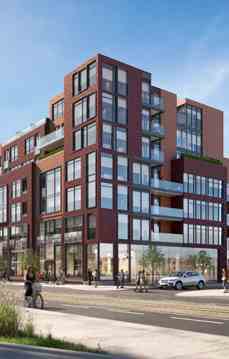 875 Queen East is a new condo development by Harhay Developments currently in preconstruction at 875 Queen Street East, Toronto.